296 pages | 115 B/W Illus. 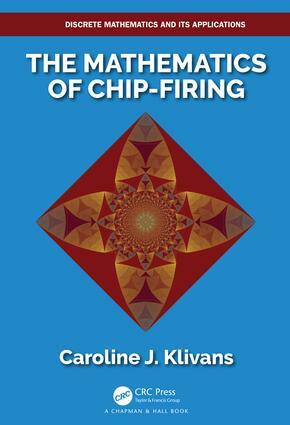 The Mathematics of Chip-firing is a solid introduction and overview of the growing field of chip-firing. It offers an appreciation for the richness and diversity of the subject. Chip-firing refers to a discrete dynamical system — a commodity is exchanged between sites of a network according to very simple local rules. Although governed by local rules, the long-term global behavior of the system reveals fascinating properties. The Fundamental properties of chip-firing are covered from a variety of perspectives. This gives the reader both a broad context of the field and concrete entry points from different backgrounds. Broken into two sections, the first examines the fundamentals of chip-firing, while the second half presents more general frameworks for chip-firing. Instructors and students will discover that this book provides a comprehensive background to approaching original sources. Caroline J. Klivans received a BA degree in mathematics from Cornell University and a PhD in applied mathematics from MIT. Currently, she is an Associate Professor in the Division of Applied Mathematics at Brown University. She is also an Associate Director of ICERM (Institute for Computational and Experimental Research in Mathematics). Before coming to Brown she held positions at MSRI, Cornell and the University of Chicago. Her research is in algebraic, geometric and topological combinatorics. The chip-firing process. Confluence. Stabilization. Toppling time. Stabilization with a sink. Long-term stable configurations. The sandpile Markov chain. Spanning trees. Statistics on Trees. Merino’s Theorem. Cori-Le Borgne bijection. Acyclic orientations. Parking functions. Dominoes. Avalanche polynomials. Toppling dynamics. Group of chip-firing equivalence. Identity. Combinatorial invariance. Sandpile groups and invariant factors. Discriminant groups. Sandpile torsors. Compelling visualizations. Infinite graphs. The one-dimensional grid. Labeled chip-firing. Two and more dimensional grids. Other lattices. The identity element. M-matrices. Chip-firing on M-matrices. Stability. Burning. Directed graphs. Cartan matrices as M-matrices. M-pairings. An illustrative example. Cell complexes. Combinatorial Laplacians. Chip-firing in higher dimensions. The sandpile group. Higher-dimensional trees. Sandpile groups. Cuts and flows. Stability. Divisors on curves. The Picard group and Abel-Jacobi theory. Riemann-Roch Theorems. Torelli’s Theorem. The Pic^g (G) torus. Metric graphs and tropical geometry. Arithmetic geometry. Arithmetical graphs. Riemann-Roch for lattices. Two variable zeta-functions. Enumerating arithmetical structures. Ideals. Toppling ideals. Tree ideals. Resolutions. Critical ideals. Riemann-Roch for monomial ideals.